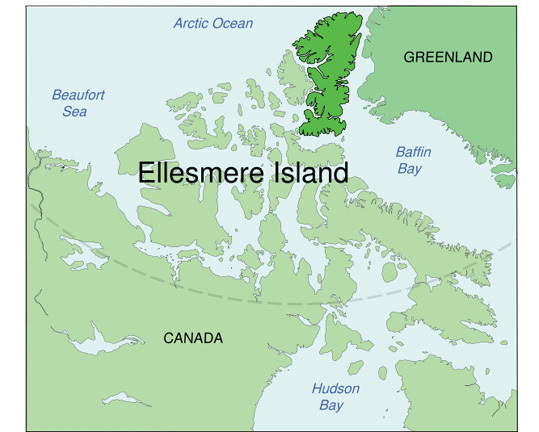 White Heat is dominated by its setting: the High Arctic of Ellesmere Island and the (fictional) Craig Island immediately to the south, under Canadian jurisdiction but on the whole left to the devices of the Inuit and the few others who live there. (The book contains a map of the region to which I referred frequently.) Too far north for snow, living is hard on the ice-clad tundra. This novel is centred on two settlements in the south of Ellesmere Island, where the Inuit struggle to make some kind of a living, many of them succumbing to alcoholism and depression. A few, such as Edie Kiglatuk and her stepson Joe, have broken away from the stereotype. Edie is a part-time teacher at the local school who supplements her income by guiding tourists who want to hunt and explore this harsh, challenging domain. Joe is studying to be a nurse: all Edie’s spare money goes towards his educational fund. The first half of this novel is a stuttering, unfocused affair. Edie takes a couple of tourists for a trek on Craig island, but disaster strikes. The incident is covered-up by the local council for reasons that Edie can’t fathom. Later, another two men book Edie and Joe to take them separately on a trip on the island. Edie’s client is Bill Fairfax, a descendant of the Victorian explorer Sir James Fairfax, who wants to see if he can find his ancestor’s last resting place. Edie is shocked when she sees the identity of the other man, who Joe is set to guide. Again, a disaster happens. In another subplot, the reader follows the daily life of policeman Derek Palliser, a man who would rather spend time mooning over his lost love Misha, or doing research on the behaviour of lemmings in the hope of publishing a breakthrough scientific article, than doing any police work. He therefore ignores Edie’s concern, which leads to yet further tragedy. These are not the only characters and events that populate the first half of the book. Almost every small contribution to the story is accompanied by detailed background information about the history, practices and psychology of the Inuit: how they are oppressed by the Canadian authorities and how their culture is in danger of collapse as much as from opportunists or self-destructive personalities within it as from any external factors. Although this background is interesting in its own right, it serves to distract from the narrative, resulting in a disconnect between the reader and any of the characters or their dilemmas. Two very sad events occur during this part of the novel, one told from Edie’s perspective and the other from Derek’s. Unfortunately, these descriptions simply fail to engage as the characters are wooden, particularly Derek in his reaction to the crime committed against him. The second half of the book describes Edie’s actions, as she is by now convinced that there are serious crimes occurring that are being covered-up or ignored. In the absence of any help, she determines to investigate herself, despite the hostility of most of those around her. In time-honoured tradition, she obtains evidence and tenaciously follows up leads, one of which takes her to Greenland and into considerable danger. The canvas of the novel broadens still further, to include possibly evil Russians, scientific research programmes, and an international oil company. Eventually the very many strands come together as it becomes clear what is behind the confusing plethora of events. Overall, I found that this book did not work for me as a novel. The author has previously written non-fiction books, including one about the “Inuit betrayal and survival in the High Arctic”; this pedigree is evident throughout the novel, impeding any sense of engagement with the characters (though Edie comes more to life in the later sections) or the rambling plot, elements being raised and then dropped unsatisfactorily, or clues suddenly being discovered that had been overlooked for the previous 200 pages. The endless details about survival on the ice, the unpleasant diet of the characters, the politics and history of the Inuit, and so on, are too much of a distraction. I found it quite an effort to read to the end of the book for this reason. 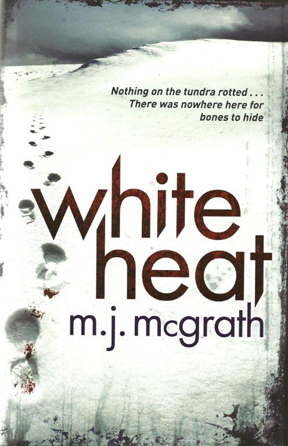 White Heat is not an apt title for the novel, so far as I am concerned. Read other, universally positive, reviews of White Heat at: The Telegraph, The Independent, It’s a Crime, Bookgeeks (Mike Stafford), and The View from the Blue House. A lone dissenting voice (apart from mine!) is at Reactions to Reading. Books set in similar regions that I enjoyed more, and found more emotionally involving about the Inuit or other far northern cultures, are: White Sky, Black Ice by Stan Jones, A Cold Day for Murder by Dana Stabenow, Miss Smilla’s Feeling for Snow by Peter Hoeg, The Tenderness of Wolves by Stef Penney, Ice Trap by Kitty Sewell and Let the Northern Lights Erase Your Name by Vendela Vida. Asa Larsson beautifully addresses similar issues in some of her novels, for example The Black Path. I really fancy reading this book if just for the setting. What a wonderful environment to read about. There is something very special about the Arctic region. It’s a shame you felt the plot wasn’t up to the setting but I am tempted to give the book a go anyway – I can see my local library has a fair few copies. Thanks for the list of better books in similar environments – there are three there I’ve not read but will track down – of the others (the Jones, Hoeg, Penney and Larsson) I agree with you – much better. Maxine – I’m sorry to hear you didn’t like this better than you did. The topic and setting just seem so interesting that I was hoping it would all have worked better. And like Bernadette, I hate to see you disappointed in what you read. But it is good to know, so that I can put this one off. Maxine: Thanks for the review. I am going to have to get this book set at the fartherest reaches of Canada and see what I think of it. After reading a non-mystery, I started reading this book. I am having a bit of trouble getting into it, probably due to the problems you describe. However, I am enjoying Edie and learning a bit as I go about Inuit culture. I don’t expect a lot and I’ll keep reading as long as I can, hopefully to the end, but maybe not. I needed a change of pace after reading an excellent non-mystery set in California. So to go from the warm Southern California climate to the Arctic region was quite a leap. I’ve read all of the books mentioned above, except the Jones, Sewell and Vida, will list them to read. Anyway, I’m giving this a try. However, some of the books I’m reading these days may make a full-fledged vegetarian out of me. The setting seemed perfect for a very different foray into fiction. I give the author credit for reaching far outside the box on that score. I wish the writer could’ve held the cohesion together to make White Heat work as a novel. Now a character I like dies, one keeping me going in the book. Mystery: Do I keep on going or will it be a DNF? We’ll see. That was a sad part, Kathy, I agree. Unfortunately for me it never really engaged but I am in a minority as attested by the reviews I’ve linked to here. You may not be in a minority here, not only with RTR. I keep wondering if it’s a DNF or if I will persevere. I haven’t picked it up in 24 hours and keep thinking of starting one of my own books or buying a few…I have a large TBR pile. Or I was going to ask here of any legal thrillers or female detective or police procedurals I might like, for instance, Aline Templeton. I’ll try Defending Jacob soon. But I think I need more women detectives — private or public, but nothing too crazy or violent. Even wit. And I’ll look at the list of what’s been read this year and liked, and may check back to the Sisters in Crime write-ups — quite enjoyable, and I did get ideas on authors but want to look again as I didn’t take notes. My next review is of the first Zoe Sharp book, Kathy. You might well enjoy her. I have ordered a legal novel by Allison Leotta, new to me, so will read/review that if any good. I am winding up and nearing the end of White Heat. I like it as I like Edie, the main character. However, the book needed more editig, condensing and cutting. It should have been cut to 300 pages. Some sections weren’t needed, as the trip to Greenland, the trip back by boat and more. I ended up skimming and speedreading some pages. Learning more about the Inuit’s history and culture is fine, actually interesting, leading me to Google more information. I will read some of those suggested above, although I’ve read the books by Stabenow, Hoeg, Penny and Larsson. I’ll read the others listed here. I want to add on books by R.C. Harlick, who, while not writing about the Inuit, does write about other Indigenous peoples in Canada. She writes well about their customs and cultures. Errata: That’s R.J. Harlick, who writes about Meg Harris, who lives in Canada but ventures forth to different locations and writes about the geography and Indigenous peoples of the region. Thanks for that information, Kathy. I agree the trip to Greenland and back, and other similar episodes, weren’t necessary or not necessary at the length provided. The history/culture of the Inuit is interesting, true, but I don’t feel I learned more than I had done from other books about the far northern people. I learned about many customs as with death, a bit about the language, with the addition of McGrath’s afterword which explains some key points about the language, and that there was a forced emigration ot Inuit to Ellesmere Island, which led me to look up the author’s non-fiction book about that: The Long Exile.at her website and to then google more information about it. A very shameful episode in 1953 due to the Canadian government’s wanting to populate the area.